Ten years ago, Hopwood Gear Ltd invested in an Oxy-Propane gas cutting machine from Kerf Developments. 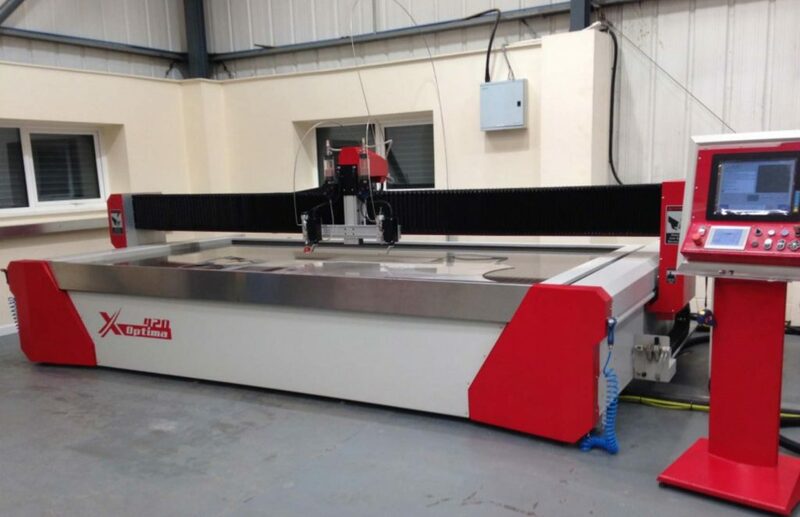 Owning a profiling machine that runs like a dream with exemplary service support for over a decade was two of the key reasons why the Oldham based subcontractor went back to Kerf Developments for its latest machine, a twin-head water jet machine. Founded in 1974, Hopwood Gear immediately set its stall out as a subcontract manufacturer with a niche for producing gears, gear sets and all associated components. Now with 40 years of gear manufacturing under its belt, Hopwood Gear is a true specialist, manufacturing gears from 4mm diameter up to 3m – and everything in between. The 33 employee company serves the defence, aerospace, automotive, white goods and consumer markets with bespoke gears for anything from a tank or submarine through to the everyday watch or washing machine. To manufacture its gears and meet the demands of its wider subcontract business, Hopwood has a machine shop stacked with CNC EDM, turning and machining centres from Agie, Haas, DMG and Mazak as well as a multitude of specialised gear production machines. The 4m by 2m machine immediately cut costs by 50% when processing steel plates up to 150mm thick. Additionally, the Scorpion cutting head allowed the Manchester company to ‘semi-finish’ large gears with its impressive precision levels. Still in operation after a decade, the Scorpion is still well used today. Nowadays, the company has a need for a more flexible machine for processing a wider range of materials at even greater precision levels – enter the Kerf Optima 420 water jet machine. Kerf Cuts Through Customer Issues With New WaterJet.. The evolving face of gear manufacture now sees Hopwood Gear producing more gears up to 50mm thick from materials such as aluminium, titanium, plastic, stainless and mild steels. For profiling these gears, Hopwood was using a subcontract profiling company at a cost of up to £5000 each month. Commenting on this, Mr Hopwood continues: “We were spending a lot of money getting gear profiles cut prior to entering our machine shop for secondary processing. However, the quality of gears was indifferent. The supply was regularly outside our tolerance band and the gears were often tapered where the water jet wasn’t cutting at 90 degrees. By installing the Kerf Optima 420 water jet machine, Hopwood Gear immediately improved the precision of its profiles, attaining a precision level of +/-0.05mm as opposed to +/-0.3mm on subcontract supplied profiles. This precision is credit to the highly acclaimed BFT high-pressure pump on the Optima 420. The enhanced precision reduced returns and it also cut the internal re-working of gears. These factors reduced lead-times, improved precision and edge finishes and also prevented labour and machine time from being unnecessarily absorbed in the machine shop. From an economic standpoint, Hopwood Gear estimates that £2000 of the £5000 monthly cost of profile cutting was actually material cost. So, by purchasing the Kerf Optima and acquiring the material direct from the stockholder, Hopwood Gear has reduced its subcontract costs by £3000 each month. The flexibility of the water jet machine means that Hopwood has also eliminated an additional £500 per month in subcontract costs for laser cutting of thin plates and discs. 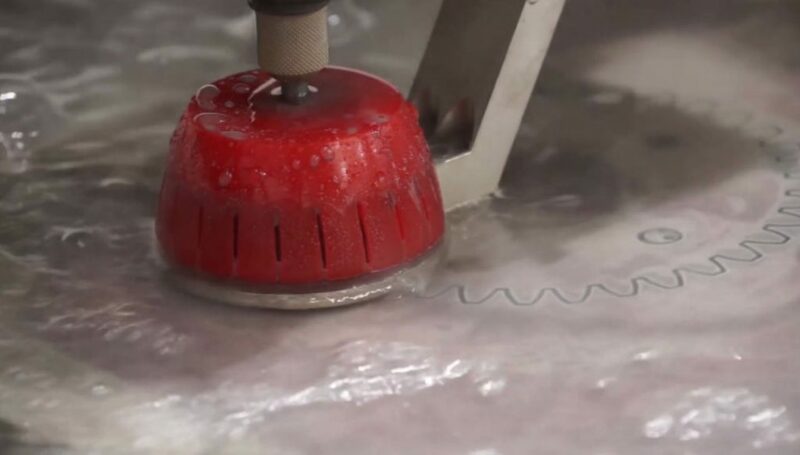 With the easy-to-use IGEMS CAD/CAM system on the Optima water jet machine, Hopwood’s staff were comprehensively trained on the machine in one-day. The unparalleled ease-of-use and the automated running of the machine allows one operator to simultaneously run a number of machines, avoiding the cost of additional staff. Furthermore, the twin-head configuration permits fast dual-cutting production. This is ideal for a company producing anything from one-off and batch work in the region 50 through to production runs up to 200,000 off. Kerf Developments are leaders in tailored profiling solutions. For more information on our Water Jet CNC Machines, visit our water jet page.